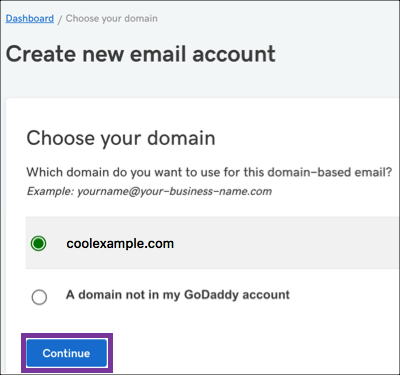 To create your email address, you'll start by selecting the domain you want associated with your Office 365 email address. These steps will walk you through how that works. Log in to your Email & Office dashboard (enter your GoDaddy username and password). If this is your first Office 365 email address, pick the domain you want to use for your email address. If you have an existing Office 365 email address, click Add user then pick the domain you want to use. Next you'll need to fill out the Create new email account form. Start by entering your Username, this username is also the name of your email address. Note: If you are creating an email address for another user, select Use a temporary password. This let's the other person create their own password. Enter your email address in the Send account info to field and click Create. When your email address is ready, you’ll receive an email creation confirmation at the email address you provided in the previous step. It takes a few minutes, or more, to set up an email address. Once you receive your confirmation email or text, you can go to the next step and set up your recovery email address. Step 2, let's set your recovery email!